At our January Coalition meeting, we recognized four members, Hillary Anderson, Hank Chapman, Brooks Baker and Stephanie Gerych, for their outstanding efforts and commitment to the Coalition. At our May 10th meeting we recognized Hornell School District Superintendent, Doug Wyant his for dedicated service to the Coalition. At our September 13th meeting we recognized Krystle Blencowe from the Institute for Human Services for her dedication and service to the Coalition and for her active and important participation in the Campbell-Savona High School Prom & Graduation - Social Host Awareness PSA. 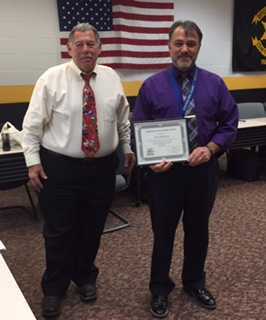 At our November 8, 2017 Annual Coalition Meeting, Joe Rumsey, Superintendent of Bath-Haverling School District and Co-Chair of the Steuben Prevention Coalition Steering Committee was recognized for his dedication and commitment to the Coalition through membership and facilitating our many activities held at the school. At our January 2018 Coalition meeting, SFC Kyle King was recognized for his many contributions and efforts on behalf of the Coalition in a short period of time. Kyle's contributions to the Coalition are a very valuable resource that make day to day operations a little bit easier. At our Tall Cop Event - High in Plain Sight on March 29, 2017 we recognized two outstanding individuals for their dedication and commitment to the Youth in our communities. If you would like to recognize an individual for their outstanding accomplishments with youth - we are specifically looking for those special individuals such as, school officials, teachers, parents, community members, first responders, law enforcement officials and social workers who have provided assistance to our youth that has directly impacted their decisions regarding the use of alcohol and other drugs. Their actions have helped guide our youth down a path that is free of alcohol or other drug use and abuse. Please help us recognize these individuals and their efforts by nominating them for a special acknowledgment and appreciation of their efforts. In your nomination, please include the nominee's name, contact information and a short description of how this individual has helped our youth make positive life choices. This recognition is an on-going effort of the coalition. Please feel free to send us nominees at any time to the Steuben Prevention Coalition office at 8 East Morris St. Bath, NY 14810. If you have any questions regarding this special recognition please contact Norman McCumiskey at nmccumiskey@dor.org, Colleen Banik at cbanik@dor.org or call our office at 607-776-6441 ext. 202 or 208.